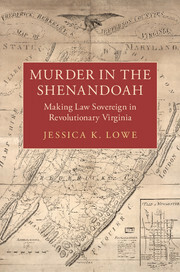 Murder in the Shenandoah Lowe Jessica K.
Add to cart the livre of Lowe Jessica K.
Introduction; 1. The facts of the fight; 2. The making of a republican judge; 3. Examination: class, procedure, and local courts in Crane's Virginia; 4. The Bloody Code and the logic of legal reform; 5. Indictment: power shifts and power continuities in Virginia's courts; 6. Crane's trial and its 'imperfect' verdict; 7. 'That stigma on my character': judges, judicial review, and 'republican' interpretation of the laws; 8. Murder or manslaughter? Crane's special verdict at the general court; 9. Pardon request: mercy and Crane's 'lunatic fits'; Conclusion.